MAYA EVENTOV (1964 - ) Having originally grown up in Leningrad (former Soviet Union), from a very young age Eventov was exposed to the Russian Avant-Garde and post-impressionist art in St. Petersburg. The palette of Matisse and Gaugin affected her interpretation of colour while Rodchenko and Malevich influenced her sense of balance and composition. 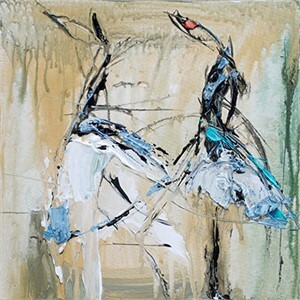 From the age of six Eventov studied art in various forms and was accepted into a prestigious High School affiliated with the St. Petersburg State Academy of Industrial and Applied Arts. After graduating in 1987 with a master’s degree in graphic design, she began working as an illustrator for children’s books. Eventov took advantage of the fall of the “Iron Curtain” and began traveling, exploring and eventually immigrated to Canada. Today, Maya and her family reside just outside of Toronto. She continues to travel, finding inspiration in the varied landscapes around the world. 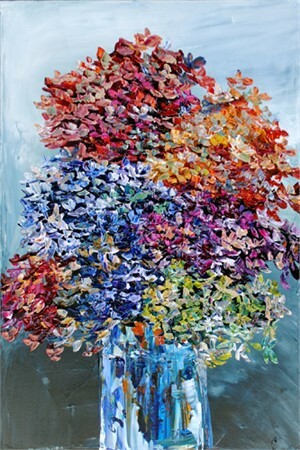 Eventov’s paintings are characterized by a thick application of acrylic paint using a selection of different sized palette knives. 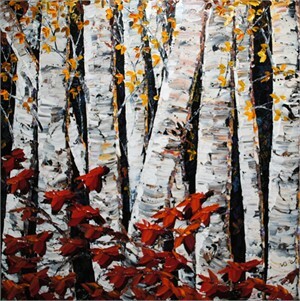 Smaller knives are used to create depth and detail in her paintings. She then uses a series of varnishes designed to create a “wet paint effect.” Eventov creates imaginary and idealized Mediterranean themed landscapes with the intention to capture the joyous freedom of a bright blue sky and quiet cafes. 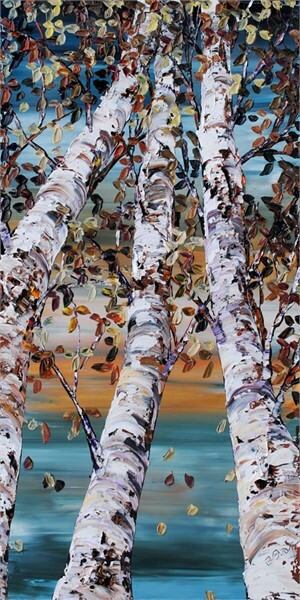 She also creates works in which the scene is reminiscent of rural landscapes in North America. 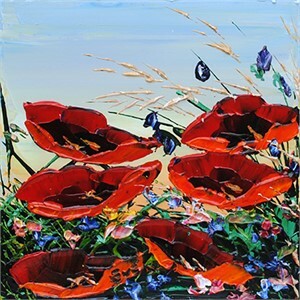 These pieces are executed using a special palette knife and imitate a mosaic technique. 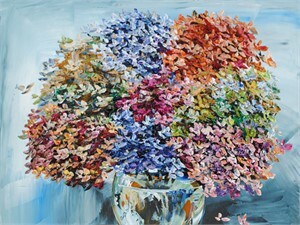 The smaller, more regular strokes allow the painting to come to life through the reaction of the viewer’s eye to the subtle shifts in colour and tone. Eventov states, “My works speak of my feelings of happiness, I love to paint, it feels great and I hope that my art is a way to transfer this positive energy and wonderful feeling to others. I want to share the warmth of the afternoon, the smell of the exotic flowers and the sensuous taste of the ripe fruit with the viewer. Wander with me through the roads of Tuscany or come enjoy a quiet moment in a romantic setting somewhere in Spain.” Her work is represented in galleries throughout Canada, Great Britain and the United States. 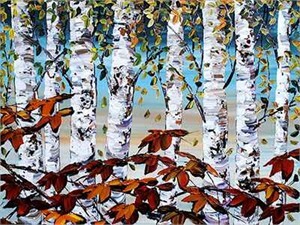 MAYA EVENTOV (1964 - ) Having originally grown up in Leningrad (former Soviet Union), from a very young age Eventov was exposed to the Russian Avant-Garde and post-impressionist art in St. Petersburg. The palette of Matisse and Gaugin affected her interpretation of colour while Rodchenko and Malevich influenced her sense of balance and composition. From the age of six Eventov studied art in various forms and was accepted into a prestigious High School affiliated with the St. Petersburg State Academy of Industrial and Applied Arts. After graduating in 1987 with a master’s degree in graphic design, she began working as an illustrator for children’s books. Eventov took advantage of the fall of the “Iron Curtain” and began traveling, exploring and eventually immigrated to Canada. Today, Maya and her family reside just outside of Toronto. She continues to travel, finding inspiration in the varied landscapes around the world. 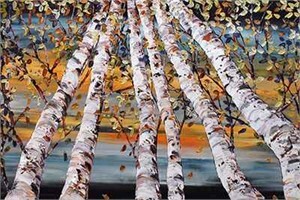 Eventov’s paintings are characterized by a thick application of acrylic paint using a selection of different sized palette knives. Smaller knives are used to create depth and detail in her paintings. 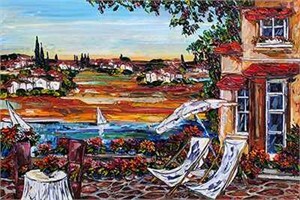 She then uses a series of varnishes designed to create a “wet paint effect.” Eventov creates imaginary and idealized Mediterranean themed landscapes with the intention to capture the joyous freedom of a bright blue sky and quiet cafes. 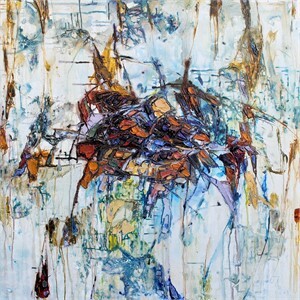 She also creates works in which the scene is reminiscent of rural landscapes in North America. 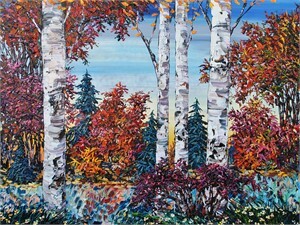 These pieces are executed using a special palette knife and imitate a mosaic technique. 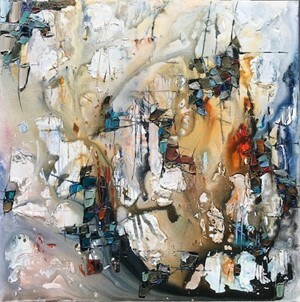 The smaller, more regular strokes allow the painting to come to life through the reaction of the viewer’s eye to the subtle shifts in colour and tone. Eventov states, “My works speak of my feelings of happiness, I love to paint, it feels great and I hope that my art is a way to transfer this positive energy and wonderful feeling to others. I want to share the warmth of the afternoon, the smell of the exotic flowers and the sensuous taste of the ripe fruit with the viewer. 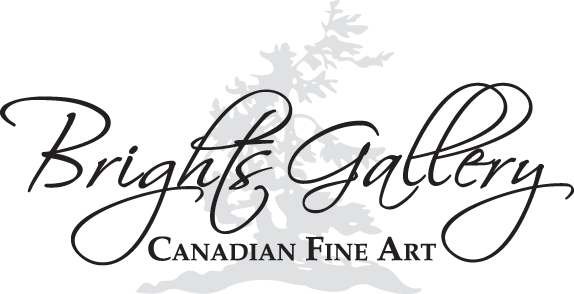 Wander with me through the roads of Tuscany or come enjoy a quiet moment in a romantic setting somewhere in Spain.” Her work is represented in galleries throughout Canada, Great Britain and the United States.